Well, it was just reported that the Sun fired of another x class flare directly at the Earth. It’ll be here tommorrow. Life has seemed very intense and rich since the last flare back on the 5th. Anyways, orgone generators are always more active and powerful during a solar storm ( or so I’ve noticed ). New from the studio are some prototype orgone lights with an arrangement of LED’s. I still need to work out some kinks… hopefully available soon. Many thanks to everyone we have met the last few Friday nights down in Grass Valley. 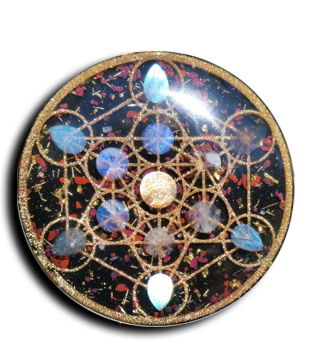 It’s always a joy for us to show our orgone creations and share the experiences we’ve had. I always love seeing everyones reactions to orgone. “Paper weights right?” Not quite, but they do work great for that also! So many beautiful young children out there attracted to this stuff. They understand it right away. Last night I watched about a dozen kids under the age of 10 put their hands over the crystal tipped orgone pieces trying to feel the chi coming out of them. All but one could feel it, their pupils would shoot wide open the moment they did. The adults were also feeling the energy too, just not as much. It took me a little while to feel the energy of a piece o f orgone. I had to put them up to my forehead to get anything, now I just feel it or use my hands. We will be doing two more shows in downtown Grass Valley, then it looks like we will be taking a little break until January 21st when we’ll be at the Holisitic Expo in Sacremento. That will be a fun show, come down and check it out if you’re in the area.